Persistent pain is defined as symptoms of discomfort which has been present for more than 6 months. There are a number of physical factors which can lead to persistent spinal pain and these are commonly related to surgical lesions such as disc disease, bony inflammation or joint dysfunction. However, in some patients with persistent pain, the physical factors are not very straightforward and medical professionals can sometimes attribute the continuing symptoms as being related to psycho-social factors. These include perception of pain, tolerance of pain and occasionally desensitisation of pain. Where there are no surgical lesions to be treated, the best approach to managing persistent pain is a combination of therapy and pain management programme. This involves ensuring that that all pain factors have been fully optimised using appropriate treatment as this will then allow therapy to progress smoothly. Your physiotherapist will discuss with you what you will need to wear during your treatment sessions. Initial and follow-ups usually last between 30 – 40 minutes (there may be some variation between different insurers). Physiotherapy does not usually hurt, but please discuss this with your physiotherapist should you have any concerns over any discomfort. Can I bring someone with me for my physiotherapy session? You are more than welcome to bring a friend or family member to the physiotherapy sessions. Research has shown that physiotherapy can be very effective for the appropriate conditions and as prevention of further injury. How will payment be taken? We will invoice your medical insurance company directly, so you do not need to worry. If you do not have insurance and are a self-payer, we ask for payment by credit / debit card. Can I pay using Private Medical Insurance? Yes, you can. We are recognised by all the major health insurance providers. This will depend on your condition, and how your treatment progresses. Your physiotherapist will discuss this with you. Yes, you can. However, we advise you to continue with your treatment plan until the end to gain maximum benefits. Can I request a male or female physiotherapist? Why London Back Pain Clinic? 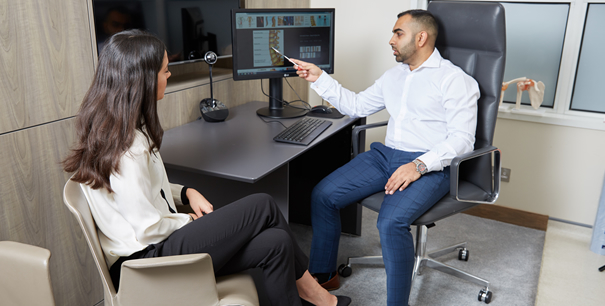 At London Back Pain Clinic, we work with a number of Spinal Pain and Sports Physicians who understand persistent pain and are able to manage this well using a multidisciplinary team approach. London Back Pain Clinic has treatment facilities located across London. I was helped by Minhal for Plantar Fasciitis in my foot. I had already seen two physios prior to seeing Minhal and neither of them were of any help. Minhal immediately recognized what needed to be done and over the course of next 2 months, via shock wave therapy and massages, cured my condition almost completely. I would highly recommend Minhal for any physiotherapy related problems. I recently saw Minhal for physiotherapy and was very satisfied with his work. He quickly identified the problem and got me back to full fitness, and did so in an approachable and down-to-earth manner. Minhal is very good at his job. He has very good listening skills and can help resolve issues of pain management and treatment in an effective and professional manner. Minhal has helped me recover from my injury quickly and in a safe and pain free manner. I would recommend Minhal for treatment of any musculo-skeletal injuries. Minhal is a true health professional whom has helped me recover from number of injuries in a short space of time - his effective and efficient care is second to none. Minhal is a master at what he does. I have been to several Physio sessions before but by far most impressed with his willingness to look after the client needs and his proactive approach to describing and making me understand in simple terms what was happening. I would have no hesitations in recommending Minhal to any of my mates or colleagues. All best for the future- keep up the great work! I was sent to Minhal to receive physio treatment. After the first treatment, I noticed improvement. Every treatment caused an improvement thanks to his hard work and expertise. I cannot recommend him enough. Cannot recommend Minhal enough. I went to see Minhal for a lower back and knee injury. A few sessions in and I was recovering well. Minhal provided a thorough consultation and took time to understand my injuries prior to working his magic. Thank you. Minhal treated me recently and within a couple of weeks my symptoms were fully under control thanks to his knowledge and efforts. He also took time during the sessions to explain exactly what the problem was and how I could self-manage any future flare-ups. I would thoroughly recommend Minhal. I was training for my first half marathon trying to raise money for charity and suffered a few injuries. Minhal gave me excellent guidance and practical support to target the affected areas and ensure I made it to the start line. Without doubt, if it had not been for him I would not have made it. In my life, I have had various injuries. Seen over a dozen physiotherapists but none of my symptoms had ever been cured completely, one of my cousins recommended Minhal to me, at this point, I just wanted somebody who could customize their approach and giving me the treatment that I needed. Thankfully I had met Minhal. Not only did he fix my issue he also booked me in to see me for all issues I had. He used methods that only top pros probably get and also very informative and very detailed. His style is unique he is a true healer and lucky I have someone I can rely on going forward! I am in therapy with Minhal for a couple of months and he has given me great advice and treatment for my back pain and health issues. Thanks for all your hard work! Cannot recommend Minhal enough. Did great work on my long-standing back problem, clearly and patiently explaining what was wrong and what needed to be fixed. I went to see Minhal with a knee problem which had been causing me stiffness and pain. A few weeks on and thanks to Minhal's advice and treatment my knee is much improved. Thanks, Minhal! I went to Minhal on the strength of his extensive experience with Musculoskeletal sports injuries. Minhal systematically approached the injury, isolating the issue and prescribing a comprehensive set of rehabilitation stretches and the efficient use of manual/electro therapy. I started seeing Karl after back surgery and his treatment has been a really important part of my recovery. He has provided effective manual therapy to improve flexibility, alleviate post-op stiffness and soreness, and reduce scarring round the site of the surgery. He has also given me an exercise plan that has progressed according to my rehabilitation. Karl is professional, friendly and easy to contact, and I would recommend him to anyone needing a physiotherapist. Karl is very professional and friendly, he doesn't just give you exercises to do and off you go! He is hands on and I have seen improvements immediately. I would recommend Karl to anyone needing a physiotherapist. He is by far the most effective physiotherapist I have had. I have a long standing back problem that aggravates from time to time. Last year, my problem aggravated quite a bit, and I was referred to Karl by my insurance for treatment and rehabilitation. He treated my back pain, and advised me on various stretching and muscle strengthening exercises to prevent further aggravation. Thanks to Karl's advise and treatment, I was able to recover quickly and was back to my daily routine in no time. I would highly recommend Karl to anyone seeking a good therapist. I went to Karl with back pain and a reduced range of movements .I had already had two lots of NHS physio. Karl has been able to help me regain a much better range of movement and I have seen a big reduction in the pain I was having. I would definitely recommend Karl to anyone who needs Physio. He is very professional, personable and effective. I highly recommend his service. Karl treated me for back pain and this was very effective. He gave me some really good advice to ensure this problem will not recur and some easy exercises to help me. He has a nice friendly manner and made me feel at ease with the treatment. I saw Karl having recently had some ineffective physiotherapy elsewhere. He gave a very detailed verbal and physical assessment of my problems, and having quickly diagnosed the problem areas in my back (and importantly, other key areas affecting the back) got straight into some really effective treatment from the first session. A few treatments later, and I have no pain, am doing all sports again, and my back feels great. Highly professional, would highly recommend! Karl was very perceptive in identifying the nature of the injuries i was carrying and was instrumental in helping me to recover from them. He was very patient and possesses great knowledge around the type of exercise plans and treatment necessary to resolve the joint difficulties I was experiencing. Overall, I found Karl to be an extremely attentive and intelligent physiotherapist who delivers targeted and effective treatment to his clients. I have been having treatment from Karl since Jan 2017 for an ongoing hamstring/back issue, which was preventing me from performing at 100% in both the gym and on the football pitch. As opposed to giving me a mundane textbook approach, Karl has ensured my treatment has allowed me to continue my work in the gym and on the football pitch while working towards a longer term fix. He understood my (then) current routine and constantly changes it to ensure it stays interesting, while still making progress. I understand my own body much better now and this would not have been possible without Karl's help. Karl has been amazing at identifying the problem and provided targeted treatment/exercises to achieve my fast recovery. Excellent professional and expertise, I highly recommend Karl! Many thanks for your extra tips and flexibility.